First end module constructed and placed upside down. Parts for the second end module can be seen on the right ready to construct. This month our attention turned to starting work on the 2 large end modules. We purchased sheets of 9mm thick ply and 12mm thick ply and cut them into enough 100mm wide strips for both of the 2 end modules. We also made some 50mm wide strips out of 9mm ply for runners underneath each module. 9mm ply was also roughly cut to shape for the tops of the 2 end modules. A series of 50mm diameter holes were pre-drilled into most of the 100mm wide strips. These holes will serve to keep the weight of the modules down without jeopardising strength and also allow space for wiring to pass through. The 100mm wide strips of the 9mm and 12mm ply were glued and screwed together to form the basic framework for one end module. A 9mm ply top was then glued and screwed on top which squared up the framework before the glued framework joints were fully dry. Some of the corners and intersections were reinforced with 100mm lengths of either 25mm or 50mm square pine glued and screwed in place. The module was then flipped upside down and 50mm wide runners were glued and screwed to the parts of the underside where the modules will slide into the trailer. After both of the end modules were constructed they were set aside for later use. First end module constructed and placed upside down. Parts for the second end module can be seen behind the first module. Our plan is to assemble the whole layout at a local hall early in the new year so we can finish all the joins between each end module and each adjacent straight module. 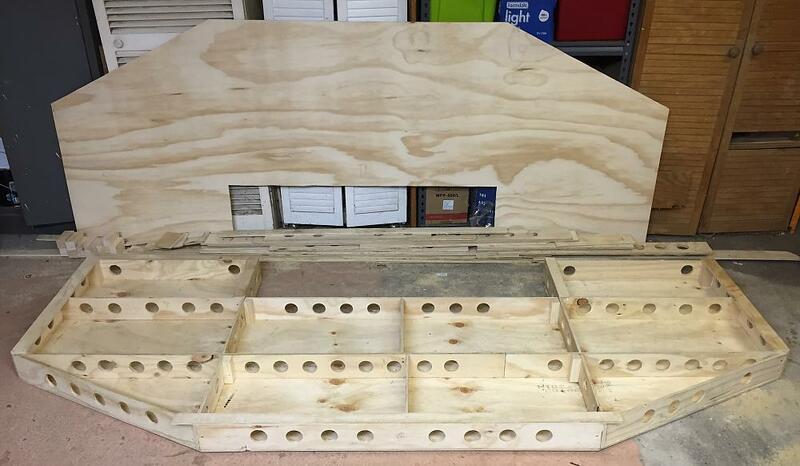 This is when the brass dowels and over-centre clamps will be fitted to align and connect each module. After this hardware is in place we can lay the track across all of the module joins. Another project tackled this month was the yellow crane over the repair siding. We were unable to find any drawings of this crane and we were unable to gain access to it to take any site measurements, so we were forced to build a model of it based only on our site photos. Using our photos and known dimensions of some nearby structures such as the repair siding sheds, we estimated the approximate size of the crane in terms of height, width and sizing of some of the major individual members. 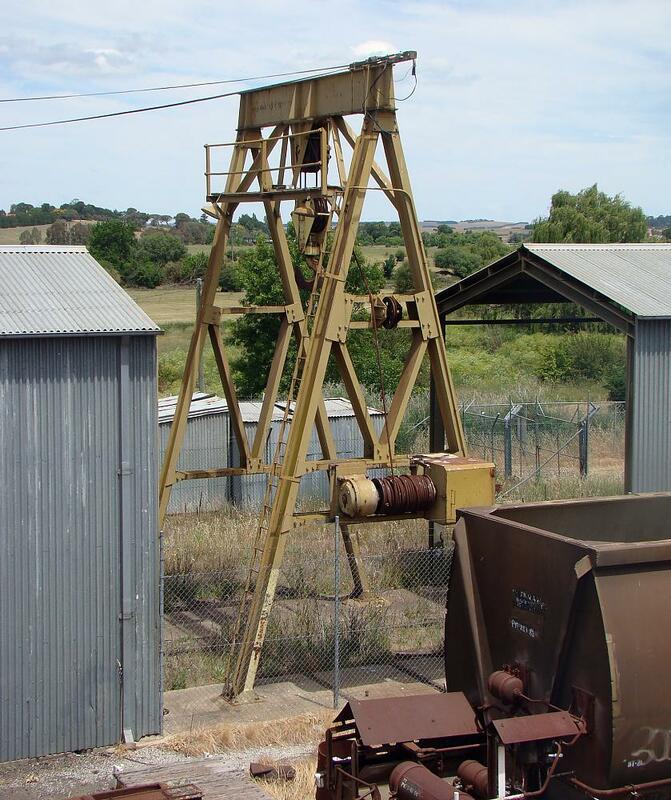 The prototype repair siding crane at Goulburn. Styrene shapes and strips were used almost exclusively for the construction. 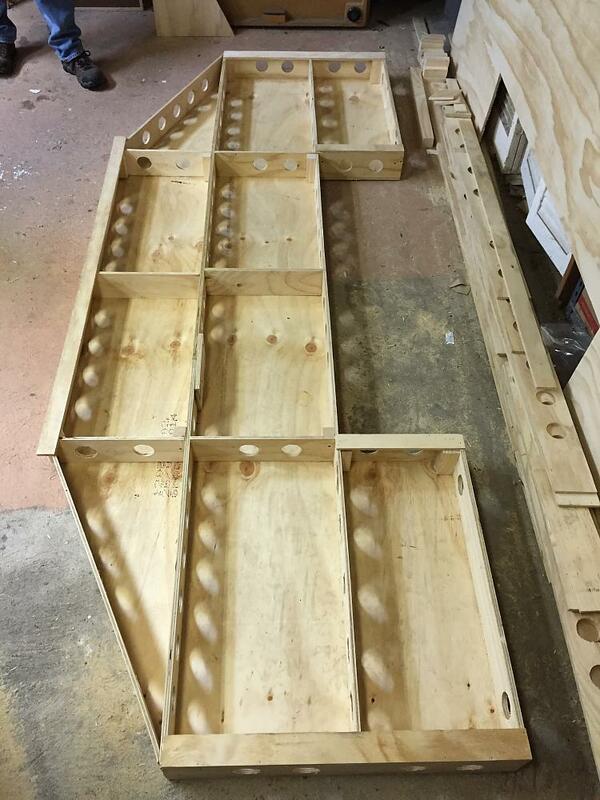 First we built one of the A-frame leg assemblies using H-beam for each leg, C-channel for the intermediate pieces, and pieces of flat sheet cut to suit for each of the gussets and cover strips. A second, almost identical, A-frame leg assembly was then built. The two leg assemblies were then stood up and glued to thin flat strips of styrene running underneath the bases of each of the legs. These strips would be covered by track, ballast and scenery material once the crane was installed on the layout. The tops of the two A-frame leg assemblies were connected with a deep I-beam, and diagonal bracing added using C-channels. The crane hook and support itself was made from sheet styrene with a small piece of round tube styrene sandwiched between. The hook part was suspended using florist wire. For the large red hook we bent up some red wire to the appropriate shape and filed the tip to a point. The crane mechanism on the front leg assembly was made up from various pieces of scrap styrene, and the elevated walkway and handrail was made from scribed styrene sheet for the deck and strip for the rail. A Uneek brand ladder was added and the whole structure was given a couple of coats of dirty yellow paint, and then some weathering with powders, before the crane was installed on the layout between the open-ended repair sheds. 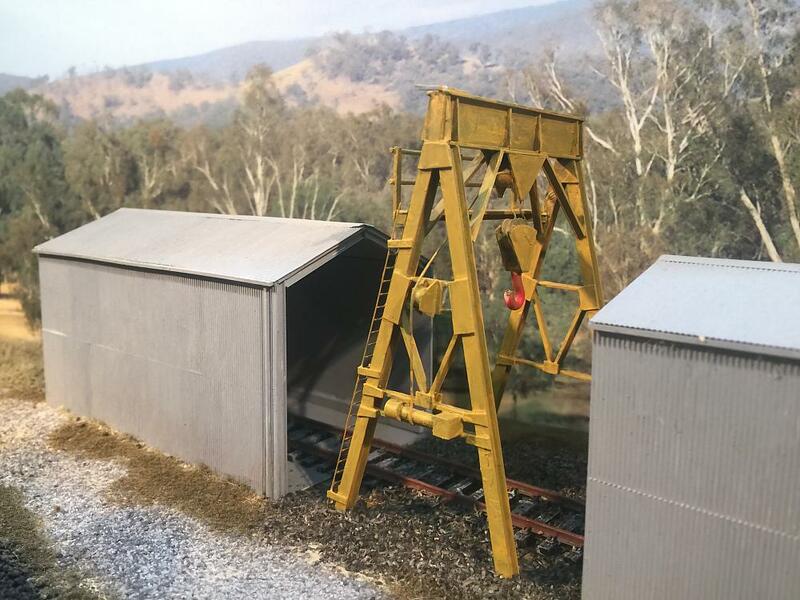 The model repair siding crane and repair sheds.